Empowering you to be your best! So how can I say diets don’t work. Well, in my opinion a diet has a start and an end. Whether it be six weeks, 12 weeks or 6 months, Most diets have a time frame attached to them. But what happens at the end of the diet? Generally when we stop dieting we eventually gain all the weight we’ve lost, I’m speaking from experience and from what I have witnessed with people I know. The reason for this is twofold; most diets are fairly restrictive when it comes to what we are allowed to eat, and some have all sorts of pills and potions that we need to take while we are dieting. Once we have achieved our goal, if we ever get there, we go back to our old habits and put all the weight back on, sometimes more. These diets are not sustainable long term and generally do more damage than good. 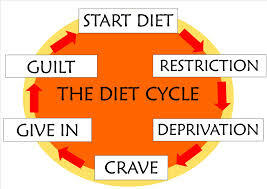 In order for a diet to work it needs to become a lifestyle, and for it to become a lifestyle it needs to be as simple and easy to follow as possible. Over the past few months I have been exposed to three lifestyle diets; “Banting”, “Paleo” & “Primal Blueprint”. They are all based on the high fat, medium protein, low carb way of eating, but after a lot of research and goal defining I chose the “Primal Blueprint” lifestyle, for the following reasons; “Paleo” is a bit more restrictive, it cuts out dairy, and it doesn’t have an exercise routine, and “Banting” doesn’t have an exercise routine. The Primal Blueprint has a really simple exercise routine which can be adapted to suite whatever goals you define and when it comes to eating you can generally live by the 80/20 rule. Eat properly 80% of the time. To put that into perspective, eating 3 meals a day equates to 90 meals a month, which means you can “stray” for 18 meals a month, again, depending on your goals. I aim more for a 90/10 rule which equates to 9 “stray” meals a month, which is easy to do. Adapting the Primal Blueprint Fitness routine to suite your goals is just as easy. If your goal is to look like Mark Sisson, left, then do everything recommended. If your goal is fitness, just do the ‘Sprint’ and ‘Move Slowly/Play/Rest’ portions, if your goal is to look trim just do the ‘Move Slowly/Play/Rest’ portions.